Talents by Anna Huckabee is a contemporary retelling of the parable of the talents (Matthew 25: 14-30) and not a book you want to miss. If you are unfamiliar with the Biblical story, I would recommend reading that first to familiarise yourself with the tale – but you don’t have to. Anna Huckabee is a new author to me – and what a powerful story teller she is. 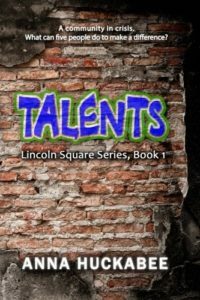 Talents is an amazing novel with great power in its words. A run down community is at the heart of the novel. It needs good hearted people to rebuild it. It needs people “investing in the community. Enriching lives.” Where we spot a need, we need to meet it. No one is ever too old to serve in God’s kingdom. If we are still breathing, we can be used. Serving others takes the focus off us. “Keeping her busy was making her feel less lost… like she was making a difference.” Changing the lives of others also changes us. Grief plays a part in the novel. Grief is painful but we can use it to motivate us for good. Individuals from all walks of life connect within Talents. They have one common goal – to change lives and to make a difference. The old, the young, male, female, educated or not – all can serve the community, using their unique talents to be the change they want to see. Talents is a powerful novel. It can be a surface read or you can dig deeper. We can all meet the needs we see. God needs all sorts of workers in His kingdom as clearly illustrated in Talents. 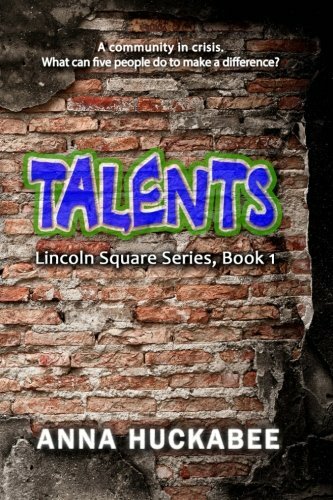 If you do not know what to read next, choose Talents, you will be glad you did. May this novel change hearts and minds and may we all take its message to heart. Thank you Anna Huckabee for such a powerful retelling of a well known Biblical story.